There are so many different pool patio materials available that deciding which one to buy for your pool can be overwhelming. Read this guide before choosing one. 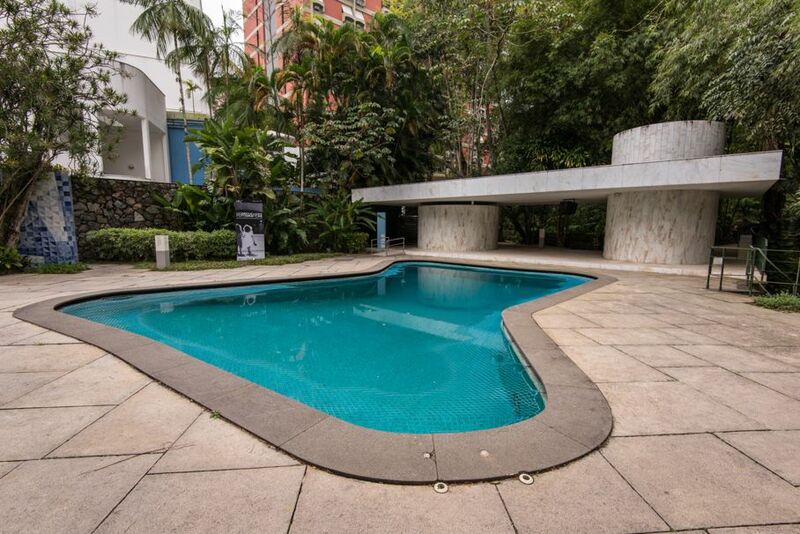 Concrete was once considered to be one of the best pool patio materials and it’s still relatively popular. It’s relatively inexpensive and comes in a wide variety of colors and patterns, and allows your deck to be customized to suit your tastes and needs. But surface problems like rigidity and cracking, maintenance issues, and the length of time concrete patios take to construct means people have begun considering alternative materials for creating a pool with a deck. Tile is a great way to add a bit of sophistication and elegance to your pool deck. Pool patio tiles come in a variety of durable and functional shapes, sizes, styles, and colors. 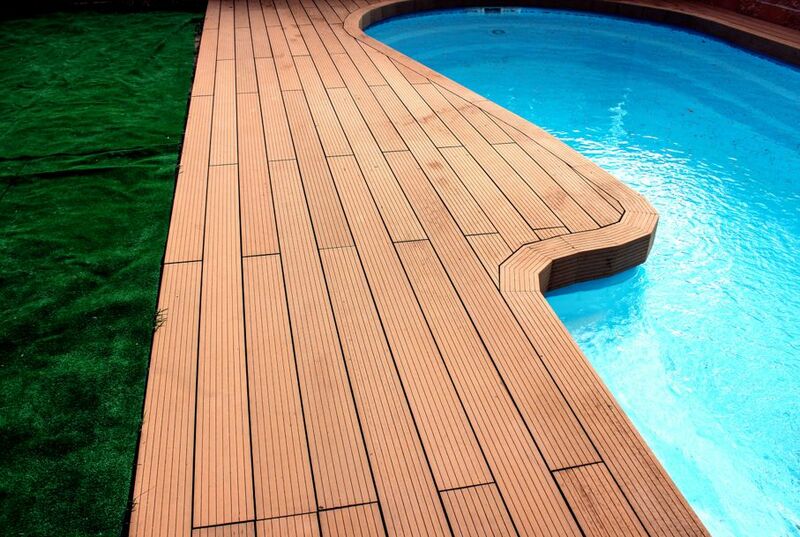 Tile can also replicate wood or glass, which can be great for lining your pool. Tiles that look like stone are also available if you want your pool patio to blend into the natural landscape. For those who want a concrete look without all the downsides of concrete, there are tiles that can also replicate concrete. But concrete-looking tiles can cost upwards of $16 per square foot, so it can be costly to install. 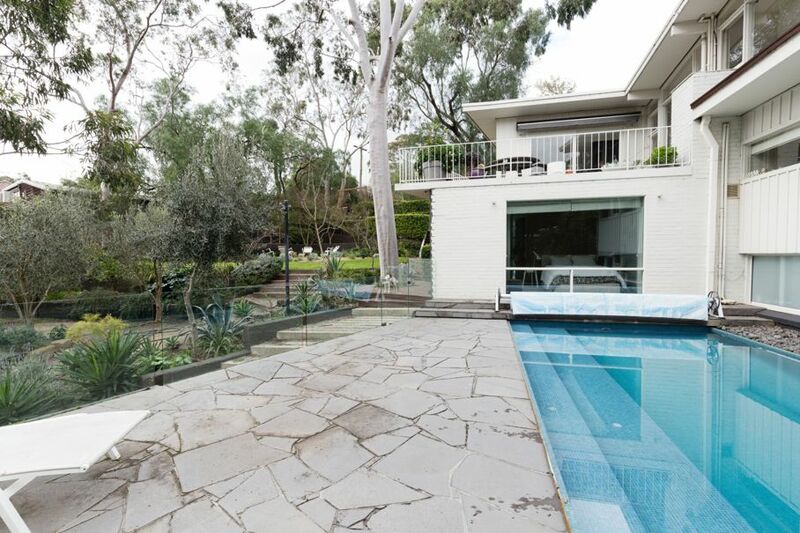 Bear in mind that not all tiles are suitable for pools, so make sure you do your homework before deciding on a style. Tiles can make your pool patio a thing of beauty and elegance. They can withstand colder temperatures, so they’re good if you live in a cold climate. Cracks in the glaze can lead to moisture in the body of the tile, so you need to make sure to use impervious or vitreous which don’t absorb water. 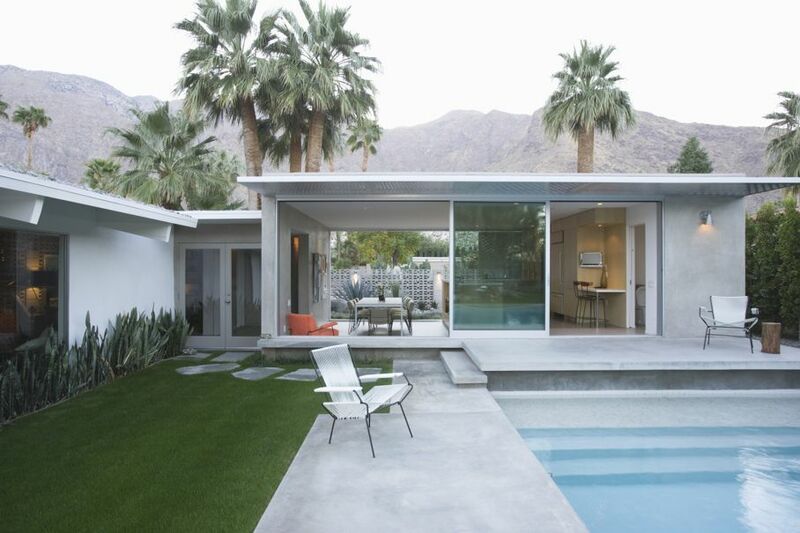 Consider paving stones if you’re looking for in-ground pool options. Pool pavers come in a range of sizes, shapes, textures, and colors. You can decide between natural stone or cheaper manufactured stone. The most commonly used stones are brick, cobble, tumbled, slate, flagstone, marble, and granite. Prices for paving stones start as low as $7.75 and go as high as $24 per square foot, but it’s the labor costs that make paving stone another expensive option. 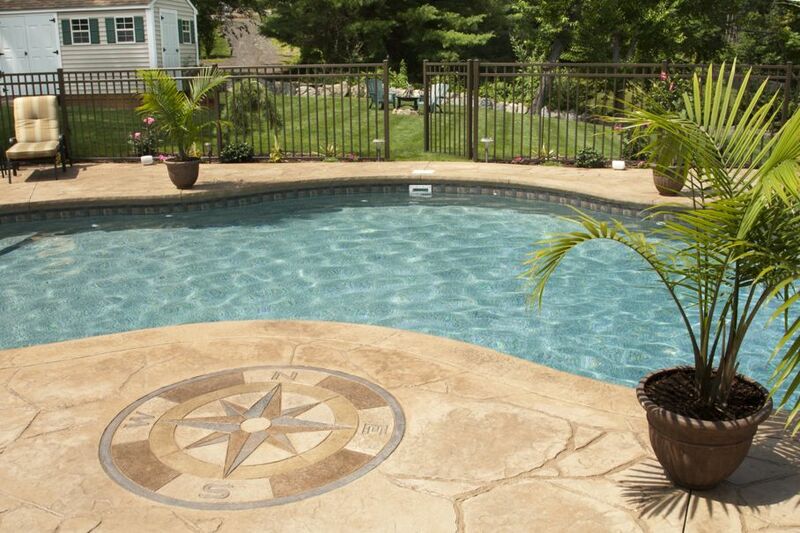 Pool pavers are fade resistant, non-skid, and non-slip. Stones can be easily replaced. Manufactured stones comes with a lifetime guarantee on broken and cracked stones. Paving stones come in a variety of patterns, colors, and textures to choose from, so you can build the deck of your dreams. They need to be resealed every season. Splashes from pools with salt-water systems can make stones deteriorate and crumble. Stamped concrete derives its names from the way it combines a base color, which is mixed into the concrete or poured on to the concrete surface with a releasing agent, with a secondary color that is scattered on top of the concrete before it’s stamped. This process gives the concrete an antiquated look that results in a gorgeous pool area for your backyard. Stamped concrete can look like flagstone, brick, slate, or wood, and comes in various patterns, textures, and colors. Stamped concrete can set you back anywhere between $8 to $18 and up per square yard. It comes in a variety of patterns and colors so you can customize your deck. It’s quick, easy, and relatively inexpensive to install. The smooth pattern can lead to slippage. It needs to be installed all at once, which makes it hard to match later. Once concrete becomes cracked, repairs are noticeable. Keystone Kool is a concrete topping that comes in a variety of colors and is a good option for pool decks because of its cool surface. It’s relatively cheap, costing between $3-$4 and $10-$12 installed. It’s cheaper than other deck materials. It can be installed over existing concrete. It comes in a variety of colors, and can be fashioned like flagstone. High pressure washing can damage it. It’s complicated to install, so make sure you use a trained installer. It must be applied to freshly-poured concrete. It can fade under the sun, and if it has to be repaired or patched, it may be hard to match. If you want a deck with a natural look, it’s hard to beat grass. You can opt to make your entire deck out of grass, or do a mixture of grass and stone or concrete features. Because your deck is likely to get a good amount of foot traffic, pick a grass that can handle it like Bermuda grass or perennial rye grass. Another alternative is artificial grass that has the look of grass without the maintenance issues. Artificial grass is also much more durable than the real thing, although artificial grass is more expensive than natural grass. Grass is comfortable and natural, and gives your deck a landscaped feel. Grass clippings can fall into the pool. Heavy foot traffic around the pool can turn your grass deck into a muddy pit. Discoloration and blotches can form over time. A grass deck requires watering and maintenance. Pesticides and fertilizers can be unhealthy for family and pets. 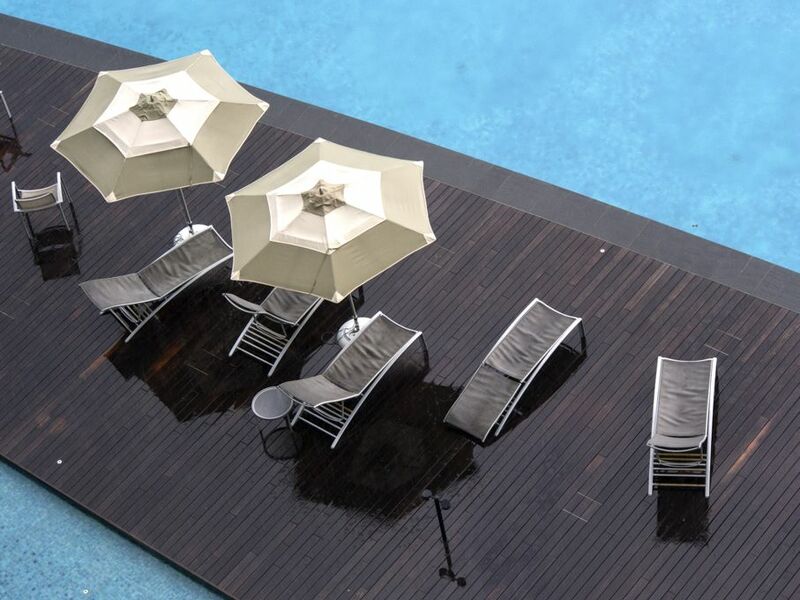 If you’re building a beachfront pool, then a wood deck may be your ideal choice because some sand will fall through the gaps in the boards instead of into your pool. Pine is a relatively cheap option, but teak is resistant to mold, mildew, and insects. Cypress has the added benefit of being strong, resistant to decay, and creating a warm and natural-looking aesthetic. For something with a bit more elegance, there’s always mahogany or redwood, which are not only sturdy, but weather-resistant. Ipe (pronounced EE-pay) is an increasingly popular choice because it’s an extremely hard and durable wood. Wood decks can complement the natural environment. Depending on the wood you choose, a wood deck can be easy to maintain. The boards can split and rot. Wood decks need to be sealed and waterproofed yearly. Wood decking materials are harder to install than other materials. Composite wood has the look and feel of wood without the maintenance issues. It combines plastic or PVC with wood fibers to create a durable surface. Higher end composites look closer to real wood, and use superior grain. Composite wood decks also come in wide range of colors with an array of add-ons like railings. Prices range from around $7 to $35 and up per square foot depending on quality. They don’t splinter or rot. They can sag and bend more than real wood does. Fiberglass can be used for both your pool and its deck to a create a seamless and low-maintenance surface that’s virtually non-porous. 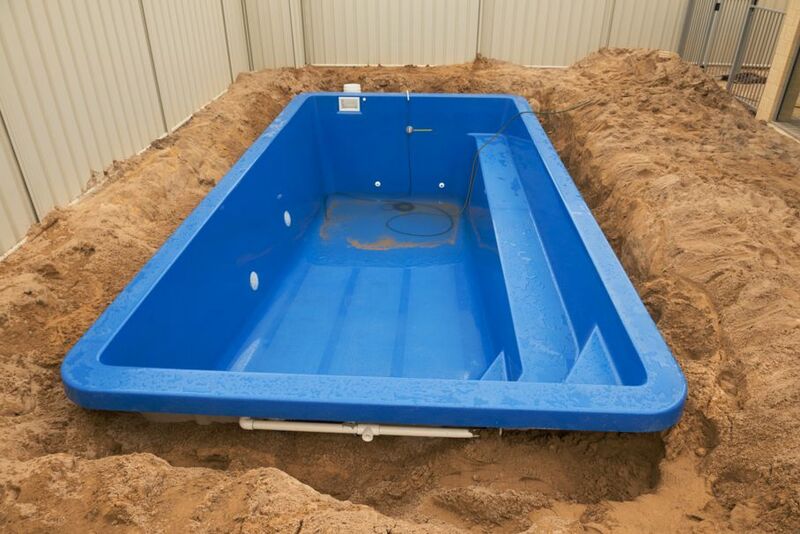 The shell of the fiber glass pool is manufactured off-site, and takes about two days to install. Fiberglass decks are durable, strong, and damage-resistant. Fiberglass pools don’t require a liner, so you don’t have to worry about punctures. They’re compatible with salt-water systems. Fiberglass pools and decks have a low lifetime cost of ownership. One size fits all and can’t be customized. Aluminum is probably the one of the best decking materials out there. Unlike wood, it won’t splinter or rot, and unlike concrete it won’t crack. It’s resistant to mold and weather, is slip-resistant, and won’t rust, peel or blister, and its surface can outlast any wood. Aluminum is lighter than wood, but also stronger and watertight. Aluminum decks can come with self-drainage channels that direct rain away to prevent puddles. But the main drawback of aluminum decks is that they cost about $10 per square yard. Aluminum is durable and weather-resistant. Its texture and color lasts a long time. It’s fire-proof and doesn’t burn. Aluminum decks can be installed in one day. Whatever materials you choose, whether you decide to build your pool deck yourself or hire someone for the job, do your homework and make sure your deck will be suitable for your family needs and budget for years to come.